I hope you are strong in the Lord and the Power of His Might!! 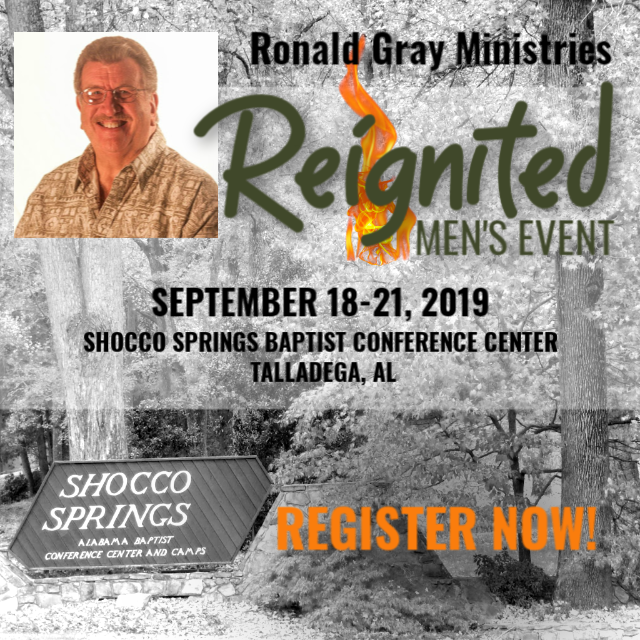 Make your plans now to join us for our 5th Annual Reignited Men's Event on September 18-21, 2019 at the Shocco Springs Baptist Conference Center, Talladega, AL. Our theme this year is FAITHFUL MEN. 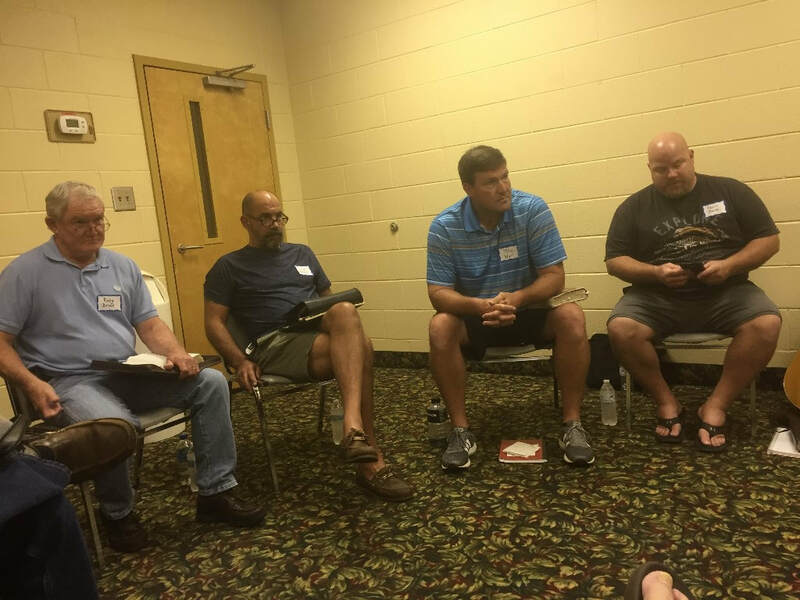 The format will be meetings on Wednesday through Friday evenings with praise and we'll have several men share from their hearts. On Thursday and Friday, we will have small groups. We will see how many men sign up and then set the number of groups. On Saturday morning, we will have time for special prayer. REGISTRATION IS REQUIRED. The cost will be $275 per man if sharing a room. $350 per man if you want a single room. Registration includes 8 meals (Wednesday dinner until Saturday breakfast) and three nights lodging. A non-refundable $100/person deposit is due upon receipt of invoice to reserve your spot. Balance paid in full no later than July 1, 2019. ​ | No refunds after July 1, 2019. Registration after July 1 will be subject to availability. 1. PAY BY DEBIT/CREDIT/PAYPAL: Upon submission of the registration form on this page, the RGM office will send an invoice to the email(s) given for the deposit or full amount as you've indicated. Deposits are due upon receipt of invoice. You will be invoiced again to pay remaining balance by July 1, 2019. 2. 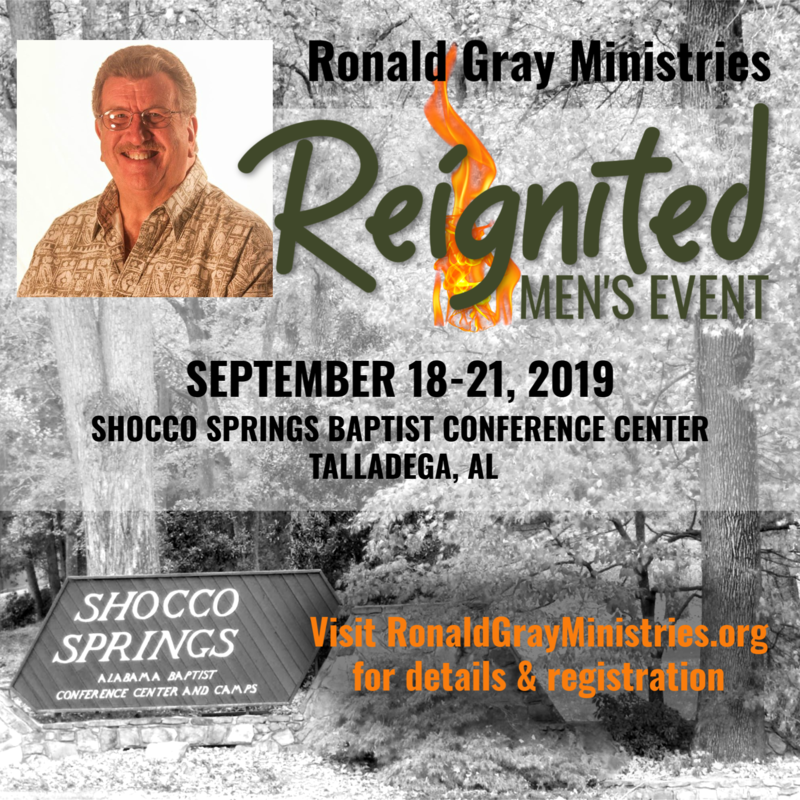 PAY BY CHECK: Upon submission of the registration form on this page, make check payable to RONALD GRAY MINISTRIES and mail to the RGM office. Deposits are due within 30 days of registration. You will be sent an invoice to pay remaining balance by July 1, 2019. Feel free to invite other men. I believe this could be a God encounter for many. Let me know if you have any questions. If you would like to share the event poster with your men's group, church, or organization, please use the link below to download. Registration includes 8 meals (Wednesday dinner until Saturday breakfast) and three nights lodging. A non-refundable $100/person deposit to reserve your spot. Deposits are due within 30 days of registration. Any remaining balance will be invoiced to the person(s) on the registration form and due in full no later than July 1, 2019. Option 1: Payment by Credit/Debit/PayPal: An invoice will be sent to you from the RGM office via the PayPal invoicing system to the email(s) given on the registration form. Option 2: Payment by Check: Make check payable to RONALD GRAY MINISTRIES for the deposit or total as indicated for each person attending. Mail to P.O. Box 1873, Daphne, Alabama 36526.